RUSK COUNTY — A date has been set for the execution of a Rusk County man who murdered his girlfriend’s baby. 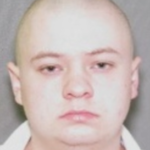 According to our news partner KETK, Blaine Milam, 28, will be put to death on January 15, 2019 for killing Amora Carson. In December 2008, Milam, along with the child’s mother, Jessica Carson, beat Amora to death with a hammer in an alleged exorcism. The pair were found guilty back in 2011. Carson was sentenced to life in prison without parole.